Deep vein thrombosis (DVT, phlebitis) among apparently healthy men and women is disturbingly common. I will see as many as two cases per month. Former national class runner, now in early 60's, developed a calf strain after a short run. This coincided with a journey by car to Auckland and back to Wellington. He had booked in with me for some deep tissue massage of the injured calf. He struggled into the office and had a pale complexion and a hint of purple on the lips. Since there was no history of an actual injury to the ankle I concentrated on assessing his pulses, blood pressure and circulation. On the basis of what I found, I referred him immediately to his doctor who immediately referred him to the hospital where it was confirmed he was suffering from blood clots in his leg. To have massaged the leg, anything other than gently, may have dislodged a clot, which may have then found its way into the lungs - not good! Four males training as endurance athletes (running and cycling). They had come to see me for help with calf pain. Two required hospital specialist treatment. One developed a blood clot on his lung. A fourth person was sent off to his doctor with a suspected silent heart attack. Massage Therapists - take note! If a person, including an athlete comes to you for a massage of a sore calf muscle, consider the possibility that the pain is due to a deep vein thrombosis. You may be the first health professional that a person with DVT related pain seeks out for relief. Be vigilant! Massaging a limb with a silent DVT may prove fatal. Be aware of the signs and symptoms and do not hesitate to get medical help if a DVT is even remotely suspected. But why did I encounter so many cases around Christmas? Well: Its easy to see why - Over-training, exhaustion, the excess stress of last minute work pressures, standing about at end of year corporate functions, drinking alcohol and eating too much fatty finger food; and then there is the Xmas shopping, kids not at school and then to top it all off - the relations arrive! Did you know that the circulation through the lower legs is reduced by as much as 50% when standing and 70% when sitting? This has serious implications for the traveler. Blood which has already given up much of its oxygen and is burdened with metabolic wastes is now pooling in the legs. When blood stagnates like this it steadily loses its freshness. This is not good for your health and general well-being. An athlete preparing to produce a world-class performance needs healthy red blood cells for peak oxygen transport and it may take up to three weeks to fully replace any damaged ones. If such damage has been done to blood cells then this is a good explanation why many athlete are feeling "flat" for a few weeks after long haul travel and seldom produce personal bests in competition. New Zealand athletes may be at greatest risk of under-performance and harm from DVT because we have to travel further than any other sporting nation for international competition. Are athletes at greater risk? Three Olympic athletes from the British team were treated for DVT in Australia 2000. It has been claimed that people who are athletic account for ten times more victims than any other risk factor. "About 85% of air travel thrombosis victims are athletic, usually endurance-type athletes like marathoners. People with slower resting blood flow are at greater risk of stasis, stagnant blood subject to clotting. Also, they are more likely to have bruises and sore muscles that can trigger clotting. No other risk factor comes close to this. Age over 60 is supposed to be a risk factor, but these victims are younger, 82% of them under 60". (http://www.airhealth.org/athletes.html). Athletic people with a lower resting pulse could be at greater risk of stasis, stagnant blood subject to clotting. The lower the pulse, the higher the possibility of blood stagnating in the legs. Some athletes cheat with "blood doping", using a hormone called EPO, to increase their red blood cell volume. This thicker, stickier blood is very prone to clotting (Blood clots in race horses was once a common cause of death - excessive use of EPO). Athletes may have better-developed superficial veins carrying more blood, reducing the flow in deep veins while at rest. Athletic people may be more likely to have bruises or sore muscles which could trigger clotting. Recent injury, even a bruise, is a well-established risk factor. Adrenal fatigue is rampant in athletes. Adrenal fatigue causes low blood pressure, an excessively low pulse and consequent pooling of blood in the legs. Adrenal stress also increases blood clotting rate and is associated with poor venous tone, causing pooling in the legs. Much has been said and written recently about the dangers of economy class syndrome, or deep vein thrombosis (DVT). 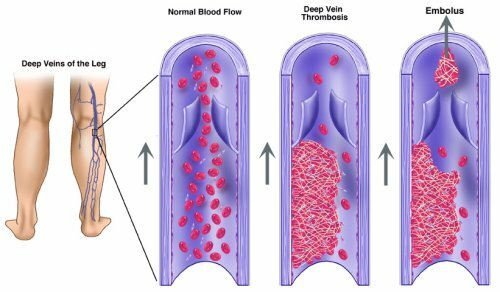 DVT refers to the formation of blood clots in the large veins of the body – usually in the legs and groin and sometimes in the arms and shoulders. It is sometimes referred to as phlebitis and there can be serious complications if a blood clot were to break loose and lodge in the lungs. Up to 20% of the total population could be at increased risk of developing blood clots. It has been estimated that there could be as many as four or five DVT cases per long haul flight with up to 10% of passengers suffering symptomless DVT. While DVT has been popularly associated with the cramped conditions of economy class travel, nobody is immune. When sitting, especially with the knees crossed, or if the edge of the seat is digging into the back of the knees, the blood vessels to and from the legs may be kinked and compressed. Muscles act as accessory pumps to the heart, pumping blood back to the heart. With knees bent and without regular and steady contraction of the leg muscles, the blood flow through the legs is seriously reduced. The same processes occur with the lymphatic circulation which refreshes the clear fluid that bathes and nourishes the body’s cells. If the lymphatic fluid is not pumped out by muscular contractions it pools in the limbs like stagnant pond water. This may show as visible swelling of the lower legs or hands. This is a very unhealthy condition for anybody - especially if you already have circulation problems. Venous blood is already low in life-giving oxygen and contains toxic waste products from cellular metabolic activity and tissue damage. This burdened blood is normally whisked back to the lungs, liver and kidneys to be re-oxygenated and cleansed - it should not be stagnating in the lower legs. If it sits about too long it will eventually go off and finally form blood clots in the leg. Athlete or not: Nobody wants a build-up of stagnant, stale blood and fluid at any time - especially when traveling to a foreign land. Whether it is through air travel, or sitting for several hours in a car - stagnated circulation – let alone DVT – is a real threat to health and vitality. An experienced traveler will tell you that the body and brain can remain tired and sluggish for as long as 36 hours after a long journey of any kind – especially if it includes changes in time zones. The legs feel heavy, achy and swollen, reactions slow, the head may ache and breathing is laboured during exercise. Stagnant blood and lymphatic fluid that accumulated in the legs during travel is now being flushed back into the system, causing a period of general systemic toxicity. Deep vein thrombosis is a life-threatening condition. The following advice is for prevention - not for treatment. If a deep vein thrombosis is suspected, then the person affected must be transported immediately to a hospital or emergency clinic for assessment by a doctor - nothing less! Do not sit for longer than one hour without getting up, moving about and stretching for several minutes. If in an aircraft, this means walking up and down the isle every half hour and/or doing special exercises. It is often very impractical and totally unsafe to get up and walk about a plane, so do so at every opportunity. If traveling by car, stop every hour for a brisk five minute walk or slow jog and don’t forget to stretch. When sitting, avoid crossing the legs. If you can – keep your feet up with knees extended. Regularly flex and extend the ankles to pump the calf muscles. Do not wear tight shoes or restrictive clothing, especially socks with elasticised cuffs that may cut circulation of the lower legs or feet. Special compression stockings do reduce venous and lymphatic pooling in the legs and the subsequent risk of DVT. While there is no research that I am aware of to prove their worth, athletes may also benefit from wearing body-hugging athletic tights that include instep stirrups, rather than elastic ankle bands. With dehydration, the blood becomes sticky. Drink plenty of water immediately before the flight and carry on board a full drink bottle of fresh water. Avoid alcohol and coffee which may increase risk of DVT – their diuretic effects may dehydrate. Avoid tobacco smoke and polluted air - carbon monoxide makes the blood sticky and reduces oxygenation. Ensure all flights are non-smoking. Keep the legs warm if the air is cold - wrap up with a warm blanket and long thick socks. Blood is a bit like gravy – when it is cold it is sticky and congeals and doesn't flow freely. Take daily up to 1,000 mg of vitamin C, 1,000 mg of natural vitamin E and up to 6,000 mg of fish oil or flax oil per day. Choose only naturally derived vitamins. Include brightly coloured berries, fruits and vegetables daily. Athlete or not - follow a heart healthy diet. Stressed? Then go do something relaxing like a long warm bath and a loving massage. Athletes should avoid long distance travel within 36 hours after bruising contact sports or injury and should not take aspirin products within 12 hours before participating in bruising contact sports. All athletes benefit from a nutritional programme to nurture their adrenal and thyroid glands - the glands that power athletic performance! But is must be natural Vitamin E - nothing else. It must read this on the product label: d-alpha tocopherol - if it does not read exactly as this, then do not take it. The sedating effects of the medication may further depress already seriously compromised circulation during travel, by relaxing the blood vessels and reducing heart rate. Being sedated, you may be even less inclined to get up, move about, stretch, or flex and extend the legs while sitting. The half-life of the medication may be several hours or longer. With individual variations among people, you may still have significant traces of the medication in them the following day. This has important implications for physical and mental performance the following day. There is little benefit in trying to induce deep sleep if this conflicts with the new sleeping and waking hours of the destination. Immediately upon arrival at your destination, do half an hour or more of steady aerobic exercise to re-oxygenate the blood and flush the system. You will benefit from gravity-assisted effleurage massage, such as where the legs are elevated above the body by a couple of pillows and the gentle massage is directed from toes to body. But do not massage if there is any suspicion of DVT present - consult a medical practitioner before proceeding. Vigorous hydrotherapy is an extremely effective way to limber stiff, sore muscles while boosting lymphatic and venous flow. When selecting accommodation, give strong preference for facilities that include a warm chest-deep swimming pool. If the travel has been across time zones, the first few days after arrival should include relatively light aerobic exercise to keep the circulation pumping. If the athletic competition venue is more than 3-4 hours travel from base, plan to be there at least 36 hours earlier with accommodation organised. If this is not possible, break up the trip with exercise and refreshment stops, arrive early with arrangements in place to minimise standing around. Be acutely aware of the possibility of incidental exposure to economy class syndrome. Getting about in unfamiliar, foreign countries can be so unlike home. What may appear on the map to be a 10 minute trip across town may turn out to be a four hour hell-journey – crammed in a sweaty vehicle, sucking on truck exhaust fumes! Carbon monoxide is a poisonous by-product of the internal combustion engine that makes the blood sticky - and it binds strongly with haemoglobin, rendering it incapable of transporting oxygen. To stay healthy you need fresh, unpolluted air, so keep out of traffic, stay away from smokers and keep hydrated. Taking your sports team out to the movies in the evening might seem like a nice thing to do, but consider the length of the journey there and back, the one to two hours spent sitting in a stuffy theater and the possible late night. It may be better to hire a good video and show it where everyone can relax, stretch out and move about at will. Coach and manager, a special warning to you - you’re probably older and less fit than your athletes and probably under extreme stress. (Stress hormones increase blood clotting rate). You are the ones in the entourage most likely to suffer DVT – and you’re more likely to suffer life-threatening complications. Be sure that these guidelines apply to yourselves, as much as to your athletes. Another thought for those whose doctors dictate rather than advise and order long term coumadin (warfarin). Study the side effects they list and the ones they don't. Calcification in vital organs similar to the ones seen after long term Vit D overdose, both are based on Vitamin K deficit and treatable by Vit K. Imagine the dilemma though in warfarin users! Can't have Vit K.
Vitamin E is worth your consideration and the best strategy for overall health is to take a combination capsule or two of the tocopherols PLUS the tocotrienols which gets close to what nature provides us with. The latter are found more in the grains so use your judgement or better find a knowledgeable health practitioner to advise you. I think the suggestion of "effleurage" massaging of legs, from toes toward body is the most ridiculous advice I have heard in many years. How is this supposed to help? If a clot is present, and many are "silent", you will improve any tightness in the leg by sending to clot and its little friends up the leg, into the vena cava, the heart and then into the lungs. Leg better, embolism in lungs. Life-threatening? You bet. Don't you just hate it when lay persons play doctor? I do hope this is posted in the public interest. This is written for healthy people doing sport. I hope you are not suggesting they just sit around and not even get a gentle massage? Even if there is a silent DVT, gentle massage is hardly going to cause problems as compared to violent sports competition or even a vigorous sports masssage. These problems are most likely to be detected early in their development by an experienced masseur, thus saving lives. The intention is to maintain blood flow while traveling to prevent stagnation which. if allowed to happen, will facilitate the development of clots and we don't want that do we? Massage, hydrotherapy, and other rythmic aerobic exercise are ideal for keeping the blood flowing - especially if an athlete is using EPO. If DVT is present, or suspected, then the ball game is very different and it is off to the Dr or emergency clinic in a jiff. So far this year, I have had four people do this with two admitted into hospital. The last one was a semi-pro soccer player who had just arrived from Europe. I drove him straight to the emergency clinic. No playing Dr here! What better would you advise to prevent blood clots in athletes? Massaging is an absolute contraindication if even the slightest suspicion of DVT exists. Since over half of all DVT incidents are without symptoms the question answers itself. I would not want to entrust my life to a masseur who may recognise some objective symptoms on the leg. It is not only elderly people who get DVT, on the contrary, olympic athletes are quite prone to it. In the USA, approximately 600 000 people per year are diagnosed and quite a few die inspite of the best medical treatment. I agree with you when it comes to prevention, blood flow is imperative. However, no amount of exercise will overcome the lack of a natural anticlotting factor in our blood which will make us prone to the condition in the first place. After all, just exercising the legs during a long flight does little to other regions that are also capable of generating clots. So what is the secret weapon? Believe it or not, a thorough reading of the work of the Shute brothers of Canada will most likely convince you of the safety and efficacy of the natural substance, d-alpha tocopherol. Unfortunately, most physicians will rely on Vitamin K antagonists like Heparin and Warfarin (Coumadin) to prevent new clots while the body is dissolving the old one(s). While this is often life saving, long term blood thinning is not without dangers, mostly from bleeding (intracranial = stroke).It also does not prevent permanent scarring in the regions that the clots were present for some time (this can include the lungs of course). Vitamin E does both. It prevents thrombus formation AND it actively removes clots, something the other "thinners" are not able to do.It also reduces the need of tissues for oxygen. Again, any massaging of the legs is potentially life threatening in susceptible individuals and, given the fact that each long haul jumbo jet is believed to carry 5 - 10 DVT sufferers, I would suggest exercising, flooding of all body areas with blood but in an active way, not passively through massage. Another smaller but important point is the balance between omega-3 and omega-6, it is often far too high on the n-6 side and, as you know, the sixes are pro-inflammatory and the threes are not. Have you heard of intermittent claudication? Also known as Buerger's Disease or Thromboangiitis obliterans? Quite common. Cure? Vitamin E. Known since the sixties. I agree with what you are saying about the need for caution with massage. Is there any evidence of harm through massage of healthy asymptomatic people? I still think it is safe and effective when done well. What happens though is people with leg pain often go to a masseur first and all masseurs need to be on the lookout for tell-tale symptoms. What you are saying about vitamin E is spot on - thanks. But can you please explain why it appears that it is never used by physicans in preference for Warfarin and other medications which, as you say, come with major long term down sides? You asked the key question. What at first glance appears to be a difficult question can easily be answered by one word: Money. Money's first cousin is control of course.Imagine the chaos if "alternative" treatments were suddenly accepted! Where would the establishment be? The Shute brothers were extremely successful with their vitamin E treatments. I am old enough to remember when they proposed the use of 800 - 2000 IU of d-alpha tocopherol (dose depending on clinical response) for Buerger's Disease. The world laughed. Then the world laughed even more when the word heart disease was mentioned in conjunction with Tocopherol. Soon, however, it became clear that many doctors were using Vit E for themselves while telling their patients it was quackery. There probably is little concern or risk in using gentle massage in healthy asymptomatic persons. However, one ought to always consider if any risk factors are present (recent surgical procedures including dental, long trips in train, bus, car, airplane, inactivity like prolonged bedrest etc. )There is a real danger if a person with a "tight leg" goes to see a masseur who may be undertrained, lazy or dismiss any concerns because he needs the money. It is not easy to diagnose clinically many cases of DVT even for experienced physicians. How many masseurs do you know who will not blink an eye when confronted with unilateral leg pain, swelling and temp difference in the absence of trauma to that leg? It happens often enough. Even patients who may suspect DVT may overlook it and enlist the services of a masseur, hoping this will prevent problems. Orthomolecular Medicine doctors will usually be the only ones who practice using Tocopherols according to W. and E. Shute. Many conventional doctors will follow the heparin/warfarin protocol while leading the patient to believe that they are now "protected". No word about risk of bleeding internally or intracranially. Thanks Dr N for your most informative comments about DVT and vitamin E.
I have noted that sales of vitamin E have plummetted over the last year here in NZ. I wonder if you can help: Is there really a difference in safety and effectiveness between the natural and synthetic versions of E? Yes, most definitely. Buying dl-alpha means synthetic of course. It is d-alpha you want. Effectiveness of the natural one is at least double although the Shute Brothers did start with the synthetic version at first. There are various kinds of Vitamin E, I prefer (for the purposes discussed here) d-alpha tocopheryl succinate. This is also an excellent adjunct in treatment of malignancies. The Vitamin E Factor by Andreas Papas PhD is a great book covering the subject but one should first obtain one of the Shute books. Let us hope that Codex does not ruin our chances to access vitamins in the near future. I am quite astonished with the number of cases of DVT that I have come across in the last year and it makes me wonder just how many go undetected - some must end up in catastrophe and other probably disappear of their own accord. I therefore am motivated to get the word out and to get it right at the same time. I am really appreciating your comments about this article.. I have done a bit of a re-write in response. Can you please have a read of it again and give me your opinion. Yes, Gary. Excellent job.I would possibly amplify the warning on effleurage massage a bit more and also be specific on the Vit E type. Spell out that only d-alpha, not dl-alpha is natural. Add to that the fact that Vit E can be seen as a protector during travel. Long haul flights are a significant cause of DVT, so whenever it is feasible, people ought to break up the flight and have one overnight stay. I think you are doing an excellent job with your website. Thans Dr N for the input. I have been away hiking the Heaphy Track for the last week. Will make the changes in the next few days and then will republish the article. Great article, Gary. I'm surprised that DVT doesn't get more publicity. Here in the States, most emergency room docs didn't even look for it until about five years ago. No article on DVT is complete without mentioning the Factor V Leiden deficiency gene. It runs in 5 percent of the US population (probably the same for any country with primarily European ancestry) and significantly increases the chance of a DVT for anyone who carries it. How significant depends on whether you're heterozygous or homozygous (the latter is quite rare but much more severe). Sadly, estrogen products for women combined with Factor V Leiden usually spell D-V-T, often in ladies in their twenties who are taking birth control pills. I had my DVT from a hormone replacement supplement and am now debating the merits of getting off warfarin after a year of maintenance dose. The material on Vitamin E is very interesting and I will take it to my physician. Loretta, Thanks for the information about the Factor V Leiden deficiency gene. I have had one client with Factor V Leiden deficiency gene. shoot first , ask questions later and Dr's know best attitude. did any Dr cure me of chronic fatigue? nope I had to to the research myself to do that. so much for medical school. If you suspect DVT ask the person if they know their blood type. The most susceptible is type A.
Wayne, I asume you have found an effective treatment (?). There are many colleagues who deny that CFS even exists. And yes, you are right, I did come on a little strong at first and it takes a big man to handle it as well as Gary did. Another thought for those whose doctors dictate rather than advise and order long term coumadin (warfarin).Study the side effects they list and the ones they don't. Calcifications in vital organs similar to the ones seen after long term Vit D overdose, both are based on Vitamin K deficit and treatable by Vit K. Imagine the dilemma though in warfarin users! Can't have Vit K.
The latter are found more in the grains so use your judgment or better find a knowledgeable doctor to advise you. I have taken part of your latest comments and added them to the bottom of the article. Let me know if this can be improved further. Your input is appreciated. I know my limitations! Gary you have done very well. One point may be of interest and that is the often recommended preventative measure of taking aspirin to prevent clotting. I would not recommend it for several reasons. Too much chance of undetected bleeding and the incidence of strokes and possibly heart attacks may be higher in those taking Aspirin according to some studies. And while Aspirin is often recommended for athletes to reduce arthritis related joint pain, the relief may only be temporary. Aspirin may accelerate arthritis. Yes, even the unbiquitous and seemingly harmless Aspirin is best done without! There are healthy alternatives. Re aspirin: after I had my DVT, I did my homework on PubMed and learned that aspirin is a platelet aggregation inhibitor and does almost nothing for fibrin clumping. Platelet aggregation is the cause of clots that produce strokes, while fibrin clumping produces DVTs. Two separate processes, two different treatments. And yes, both warfarin and aspirin run the risk of internal bleeding. The science behind using Vitamin E for this purpose seems to be sound. The challenge for me has been finding a physician that follows orthomolecular principles. I'm really interested in this thread. I've been diagnosed with a DVT twice. Neither event had a traceable cause. After the second DVT I was advised to stay on warfarin for life. Vitamin E sounds like a great alternative. However, whenever I've taken this in the past (as a nail strengther and skin toner) I have felt nauseous. Does anyone know if there is a likely reason for this? Another possibility is you have poor liver function due to medication or exposure to chemicals or heavy metals at some time in your life. Vitamin E may be eliciting a "detox". Best next step is to arrange to consult me. DVT is closely associated with stress, thyroid and adrenal issues.